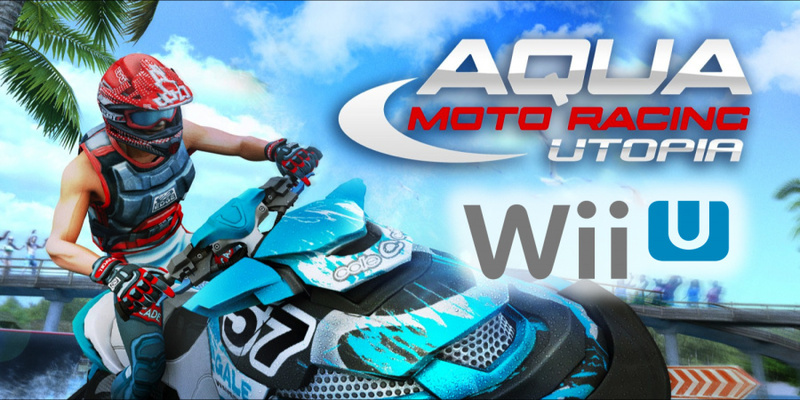 Zordix Games has revealed that Aqua Moto Racing Utopia is now complete and ready for release on Wii U, and that the game will be available on the console's eShop "soon". Aqua Moto Racing Utopia has had a very interesting few years indeed. We initially heard about the game being developed for Wii U way back in February of 2014, but as the next few months went by with no news, we started to worry about what might be causing such a delay. Jumping way forward to November 2017 we finally saw the game arrive on Switch in Europe, with a North American release arriving just last month. In a slightly surprising move, but one that is definitely commendable, Zordix has seemingly stuck with its original promise from all those years ago, following up on the recent Switch release with a version on Wii U. This Wii U edition appears to contain all the bells and whistles present in other versions - you can check out our review of the Switch version of the game if you'd like to know more. Have you already played the game on Switch? Have you been desperately hoping to see this Wii U release? Let us know down below. Sure, so the three people who still play their Wii U have a new game to play. Good on the developer though for keeping their word. You only gave the Switch version a 5/10. Surely this version is going to be inferior, or at best the same. Shame it took so long for what sounds like a disappointing result. @Zuljaras I think it was some kind of controller for the Wii? I love the genre - water race - and I think that, in general, racing games are lacking on the Switch. What I really would like to see is the same kind of commitment from Nintendo and getting their act together to release a new Wave Race. Honestly didn't expect to see any more games released for the Wii u at this stage, support pretty much vanished the second BotW came out. Not interested in this anyway, still got a pile of stuff on my Wii u to play, once I finish uni and can pull the damn thing back out of its cupboard. @chardir I'm still holding out for the SNES port. Is a Wii U a Add on for the switch ? I miss the blue theme. I love my switch, but I still play my Wii U. So I think this awesome of them! The Switch eShop is a crowded place to try and get noticed right now. I picture the Wii U eShop with tumble weed blowing through it, so I guess there may be some sense in trying to target the group who only own a Wii U.
I want another valet parking game, please. Wave Race was so good. I still remember the music and the chills that I got when I played on the lake for the first time. Such a masterpiece which we may never see again. is this game even available on the Switch here in NTSC land? Wii U Install base is still just a bit less than Switch, right? I think it's great that this developer/publisher was able to keep the promise when others couldn't pull it off. I hope they get a return on it. As much as Nintendo has abandoned Wii U, it still plays games, and I still have a backlog on it myself. My son was just waxing nostalgic over Disney Infinity which he loved playing on it, and wishing they'd continue it. We still go back to games on it even though Switch is always the first stop, now. I have a feeling Wii U will be his favorite console even going into adulthood. We played the bits out of Nintendo Land for 4 years. It would be interesting to get some percentages of people who own both, or just one or the other for some perspective. In my own anecdotal circles the ratio is about 50/50 for Switch owners: half own a Wii U, half don't. I think I'll do the same. The game looks pretty for sure. @sillygostly I have to admit that Valet Parking '89 is an addictive game and the one reason I'd pay attention to this release! This will be great for those who still rely on their Wii U! The Internet browsing experience is like no other. It's like no other, man. But does it unlock stamps for Miiverse? The Wii U still lives. Screw the haters. This is a fantastic game, the first one is better but this is tsill really good. @Stocksy I got this and the first one on PS4 for 3 quid. Awesome! Will definitely be picking this up on the Wii U. Playing on the gamepad is such a better experience than playing in handheld mode on the Switch... Real analog sticks, real D-pad, and it actually fits in your hands. @YANDMAN aren’t they both £30 on eshop? Scandalous really... £3 is a bargain. Glad i didn't buy it on the Switch then. I'll pick this up for my Wii U. This looks fun. Watched a video review of the game. @Stocksy I haven't honestly looked at the eshop listing yet. If they are that much then that is nothing more than Nintendo profiteering. Before i owned a PS4 or Steam everything i bought was on a NIntendo console and i just paid it because i wanted to play it. Since and learning the realities of what these games cost on other platforms it makes me scratch my head. I know people claim oh it takes longer to port etc but thats nonsense. @Sakura7 I don't think it's hate, more like bewilderment. Wii U still gets new games in 2018, so its not usual. As much as I love the Wii U, this is far too late now. @Stocksy Well they will soon learn when nobody buys them. Definitely one to watch for in the sales. gave back the switch i had and still use the streaming apps and browser on wii u to this day, like right now. with this comment.